Welcome to Sewing 101. We've made it through a years worth of sewing tips and inspiration. 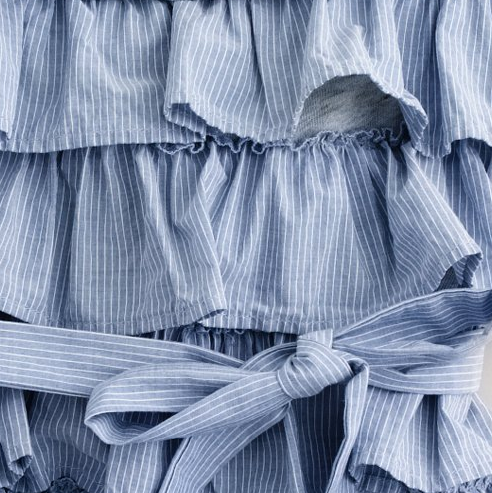 Today's contributor is Jenny from The Southern Institute, here to share some great tips for making ruffles. I'm so flattered to be a part of the Sewing 101 series here at Pickup Some Creativity. What a wonderful resource for beginner and advanced sewers alike! I'm happy to be sharing a tutorial with you all today. 1. Cut a strip of fabric about twice the length that you would like the ruffle to be, and as wide as you would like it to be. Use a traditional hem to hem both long sides of the strip. 2. On your machine, set your stitch length to the longest setting... on my machine that is a 7. This is called a basting stitch. 3. Using your basting stitch, sew right down the middle of your strip of fabric, making sure to leave plenty of thread at both ends. DO NOT back stitch at either end. 4. Pick up one of the threads on one end of the fabric and gently start to scrunch the fabric down the length of thread, while pulling gently at the thread. This creates your gather or ruffle. 1. Start with another strip of fabric, just like the first, with the long edges hemmed. This time we are going to be sewing along one long edge, instead of the middle. Using a basting stitch again, sew down one long edge of the strip, 3/8 of an inch in from the edge. Make sure to leave long threads at each end, and no back stitching. 2. Sew a second line at 5/8 of an inch, right alongside of the first line of stitching. 3. Using your long threads, pulling gently, gather up the fabric to your liking. 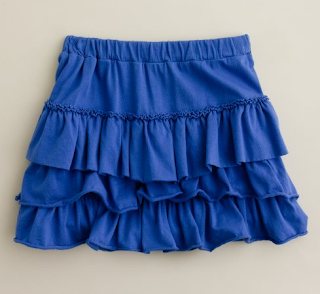 Two different types of ruffles to use in your sewing. Thanks so much, Jenny. Ruffles are such a great detail to add to almost any project. Please pop over and visit Jenny's blog. She has great tutorials, healthy recipes, including this fabulous super hero cape and cuff she shared during Celebrate the Boy. Thanks for including ruffles and congratulations on reaching a year's worth of tips!! A friend recently asked me for sewing tips and I directed her to your sewing 101 page as a good place to start! I linked to my Seams Inspired 3 T-Shirts and a Dress post, as I incorporated ruffles into the dress. Fun stuff! Thanks for the year's worth of tips, Chris! ...and thanks to Jenny too for sharing this one! Thank you for such a fantastic tutorial/informative post. Thanks for the tutorial, Jenny. I've never tried a center-gathered ruffle, but I aim to now that I know how easy it is. Best ruffle tutorial I have seen. The pictures are great and very detailed, leaving no confusion. Thanks! Thank you! I've always avoided ruffles, but you made it look so easy! I'm now hooked on ruffling!!! Thanks again. Think you! I'm s novice sewer. I bought a pattern and wasn't sure how to do this, but you make it look so easy!